Last night we had the joy of seeing Terry Gilliam’s latest film, The Imaginarium of Doctor Parnassus, followed by a Q&A with the great director himself. All very exciting stuff. The film is awesome, a fantastical myth making tale along the lines of Baron Munchausen, with great performances from all the actors. The way in which Heath Ledger’s untimely departure from halfway through filming is handled extremely well and, if anything, adds to the film – as in some scenes Heath’s English accent veers a little antipodean or is smothered in excessive use of the word ‘mate’. Lily Cole is visually stunning and hypnotising as Parnassus’ daughter, unaware of her imminent fate as the trade made in a bet between Parnassus and the Devil – played excellently by Christopher Plummer and Tom Wait respectively. Why are Gilliam’s casting choices always so spot on? 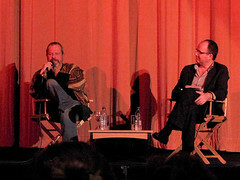 After the fun of the film we got to spend a while in Q&A with Terry Gilliam. He was at ease, happy to go into stories, and full of interesting anecdotes. The only annoyance was the apparent inability for some audience members to not ask questions regarding Heath’s death and family, all of which had been answered by Terry in many of his recent interviews or were just deeply inappropriate. Post Q&A Terry was thronged by fans outside in the bar, some more greedy with his time than others, but thankfully he found a few seconds on the way out the day to sign my favourite Brazil DVD. Huzah! Fanboy #2 goal achieved (#1 being meeting Eddie Izzard back in ’98 of course).